It has only been two games since DeMarcus Cousins made his long-awaited debut for the Golden State Warriors. But if those two games are any indication, the rest of the NBA can pretty much call it quits on the remainder of the season. Golden State headed to Los Angeles for a recent two-game stretch against the Clippers and Lakers. It’s not as much about the competition as it is about just how dominant the Warriors were — specifically with Cousins on the court. Now winners of eight consecutive games, the Warriors have hit extreme death-star mode with Cousins in the mix. Here’s a look at the astonishing stats and why the rest of the Association must be having a hapless feeling. Cousins makes a major difference: His advanced stats are ridiculous. While Cousins is averaging 11 points in just 18 minutes of action, the Warriors are plus-45 with him on the court. That includes an absurd plus-35 in the 18 minutes that Golden State’s starting five is playing together. In those 18 minutes, opponents have scored a combined 20 points and are shooting 16.7 percent from the field. The impact is real: With Cousins inside, the shooters are getting better looks. Klay Thompson broke an NBA record by hitting his first 10 threes for #DubNation against #LakeShow Monday night. Klay Thompson broke the NBA record by hitting his first 10 three-point attempts against the Lakers on Monday night. He took a grand total of three dribbles on those attempts — lighting up the Lakers in the third quarter alone. Shockingly, the combination of Kevin Durant and Stephen Curry are shooting 8-of-30 (27 percent) from distance since Cousins joined the lineup. Just wait until they start hitting their stride. 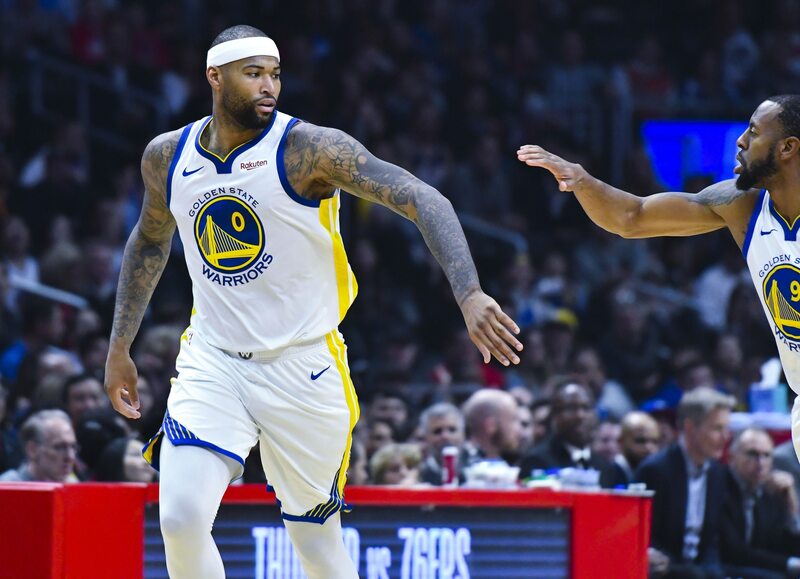 Foundation was already built: Despite some earlier-season struggles, Golden State was playing tremendous ball prior to Cousins joining the lineup. The Warriors have now won eight consecutive games. It’s a span of action that has seen the two-time defending champs average 130.9 points per game and outscore their opponents by 18-plus points per outing. Thompson, Durant and Curry are all averaging north of 26 points and shooting well over 50 percent during this winning streak. Cousins is a perfect fit: Not since the Warriors’ dynasty began have they boasted an inside force like this. Just wait until Cousins starts drawing double teams in the low block. It has not happened as he continues to get his sea legs under him. Once that does take hold, the big three will see open looks a vast majority of the time. One of the most underrated aspects of Cousins’ game is his passing. Remember, he averaged 5.4 assists per game for the Pelicans last season. When all five Warriors starters are on the court, they boast plus-level passers at every position. Consider this: Golden State has tallied 72 assists on 92 field goals over the past two games. In addition to all of this, Cousins’ ability to fit in with the Warriors makes them big-time players on the buyout market leading up to next month’s trade deadline. Golden State had previously noted it was looking for center help. Given Cousins’ performance, that might not be the case. Instead, Golden State could make a play for either Carmelo Anthony or J.R. Smith — creating even more depth for the stretch run.